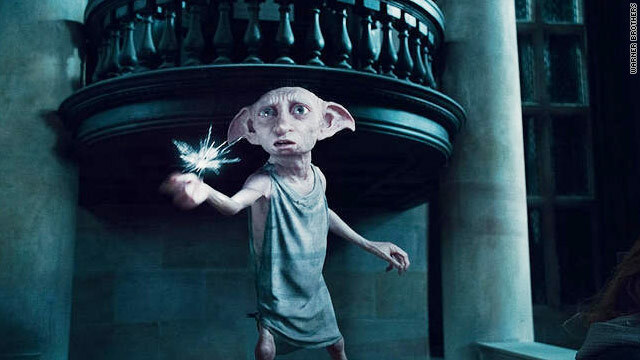 Dobby the house elf heroically saves his friends from Bellatrix Lestrange in the Malfoy mansion, but at a great cost. SPOILER ALERT: Don't read any further if you want no knowledge of the plot of "Harry Potter and the Deathly Hallows, Part 1" or "Breaking Dawn" from the Twilight series. (CNN) -- Fans of Harry Potter have a lot to talk about this morning. After months of updates to trailers, a stream of released stills and interviews with Emma Watson, Rupert Grint and Daniel Radcliffe, fans across the country have finally seen the beginning of the end. As they shake off the effects of a late night at the theater, the euphoria of the line parties subsides and the inevitable struggle settles in: Did "Harry Potter and the Deathly Hallows, Part 1" do justice to J.K. Rowling's final installation of the series? "I hope they do a good job on Dobby's death scene," said Traci Dammann, 34, before the midnight showing in Atlanta, Georgia, on Thursday. "It really moved me in the book." Dammann, founder of a Harry Potter fan group in Atlanta, was also worried about how the film would portray Hermione's torture scene at Malfoy mansion. "I just want it to be done how I imagined it, and correctly," she said. "It was gut-wrenching when I read it, and I want it to be gut-wrenching on the screen." Fans of the seven-book series chronicling a young wizard's coming-of-age in a fantastic and dangerous, magical world have a lot of emotion invested in the franchise. In many cases, they grew up reading the books, and for the past 10 years they've watched the actors portraying Harry Potter and his friends grow up themselves in seven big screen adaptations from Warner Brothers. Warner Brothers, like CNN, is owned by Time Warner. But also, for the last decade, Harry Potter fans have been disappointed by what plot points were left out of the movies and the inexplicable additions or director choices made when bringing the books to cinematic life. "I think most people are pretty happy with the way [the movies] turned out, but all fans that I have talked to have problems with the movies," Dammann said. "Harry's eyes in the movie are blue and ... in the books they're green," she said. "This is a huge thing to a lot of the fans because they're just so invested." Spoiler alert: "Harry Potter and the Deathly Hallows, Part 1" has an already well-publicized additional scene, featuring Harry Potter and Hermione Granger slow-dancing -- a nod to fans who have long wondered if the two should be more than friends. The answer, decidedly played in the film, is "no." Other plot points fans are concerned about being translated "correctly" include the emotional death scenes of Mad-Eye Moody and Hedwig, Harry Potter's beloved owl, as well as the professor Snape backstory. "When you get to 'The Deathly Hallows,' you've really kind of shot yourself in the foot if you don't have enough of that, because it's a major plot [development]," said Cleolinda Jones, a blogger and author of "Movies in Fifteen Minutes." Harry Potter fans are not alone in their angst. Other fantasy book series have become popular movie series, including "Lord of the Rings," "Twilight," and "The Chronicles of Narnia." Fans of those movies and books wrestle with the same kinds of frustrations. "When 'The Fellowship' came out, some fans were horrified by the changes," said Pat Dawson, a senior staff member of TheOneRing.net, a J.R.R. Tolkein fan forum. "One of the things they did with 'Lord of the Rings,' and I've heard they do this with 'Harry Potter,' too: [Filmmakers] think that there needs to be humor that wasn't there in the book," Dawson said. "They also will emphasize romance that maybe wasn't there in the book," like with Arwen and Aragorn, she said. "Tolkein pretty much left that out of the book completely." "But as the next two movies came out, there were even more changes, so people [ended up] looking back fondly on 'The Fellowship' as one of their favorites of the three movies because it was so true to the book," Dawson said. She said the Harry Potter movie franchise started to fall short of fan expectations with the third movie, "The Prisoner of Azkaban." iReport: Your reviews of "Potter"
Because of a new director and such prolific source material, she felt it was not only difficult in this case to be as true to the book, but "it was untrue to the book in a lot of ways that fans were horrified by." Adding to the fan frustration is the fact that the Harry Potter movies are almost over. The latest Harry Potter movie represents half of J.K. Rowling's 759-page series finale. The last movie adaptation -- "Harry Potter and the Deathly Hallows, Part 2" -- will be in theaters next summer. Knowing that the magical world they've enjoyed for well over a decade will be taking a bow from the big screen can be stressful and sad for fans. "Twilight" fans are at a turning point in that franchise's movie arc, too, Jones said. "They have a very specific kind of anxiety," Jones said. That's because there's a key scene in "Breaking Dawn," the fourth novel in Stephenie Meyer's series, that fans hope will not be taken the wrong way by mainstream audiences. The complicated scene involves the character Jacob -- the werewolf -- falling in love with Bella and Edward's halfling vampire baby. Jones says the leaked scripts seem to indicate the scene is true to the book. So, what can fans do when their favorite fantasy franchise movies conclude? "Look forward to all the extras on the extended editions," said Dawson, who has experienced a similar grieving process with the "Lord of the Rings" movies. "Just really enjoy the last couple of movies. Just sit there and really get into them and enjoy the fandom and everything that comes from that." Even with tribulations over plot changes and character portrayals, most fans of these fantasy franchises still feel compelled to see the movies and share in the excitement over any new release. "It's seeing Harry Potter come to life," Dammann said. "Even if there are parts that aren't perfect or aren't exactly what you want, there are so many things that are right."